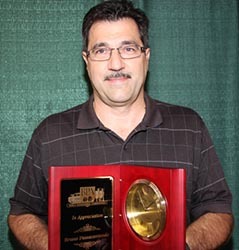 PASSACANTANDO WINS HOBBY SERVICE AWARD: Bruno Passacantando became the 15th recipient of BPA's Hobby Service Award at the 2014 Annual Meeting. WBC runs on the volunteer efforts of your fellow gamers' from the GMs that run the events to the support staff that does all the behind-the-scenes work to your unpaid Board of Directors that calls the shots. WBC will draw over 2,000 people--the vast majority of whom will never give a second thought to participation in any way beyond their attendance. Only 10% will take a moment to vote in our elections. Yet, those 10% manage to make it happen year after year on the backs of the same tried and true hobby stalwarts. Our Hobby Service Award is devoted to recognizing the efforts of the best of the best with an annual moment of recognition for their selfless participation. Bruno earned our admiration for serving as our Treasurer for more years than I can recall and has been a regular attendee since 1994. He volunteered his CPA expertise--gained from years of operating his own firm--to safeguard our financial well being. If memory serves, he was around for the crucial early dealings with America’s favorite regulatory agency and navigating those hazardous waters is scary stuff indeed--even moreso given recent revelations about the IRS. If the tedium doesn’t get you, you’re liable to be crushed by a landslide of government regulations. If there’s a harder job than navigating the bureaucratic maze of the government, I’m not aware of it. He must have done a good job because we’re still solvent. At WBC, he can usually be found splitting his time between wargames such as Great Campaigns and Breakout: Normandy and just about all of the various sports tournaments--having earned laurels in most of them. If you have the opportunity, I hope you will thank him for his service by giving him a few laurels of your own. WBC 2014 ATTENDANCE RECORD: We set another attendance record during our ninth year in Lancaster. In all, players from over 50 states and Canadian provinces plus a record 21 nations attended in 2014. 24 events drew triple-digit participation--another all time high! All of the scheduled 159 events achieved tournament status with fields ranging from a minimum of eight to a record 303 players for Ticket to Ride! This year’s champions are now listed online at the Sneak Peek of Champs page. A more complete listing of the top six places, updated laurel totals, photos and anecdotes for every event as only WBC does it will appear on our website in November. Fourteen reigning WBC champions successfully defended their titles, led by the Master, James Pei, who extended his dominance in For The People to six straight years to maintain his hold on WBC's longest current winning streak. Curt Collins II remained his closest pursuer with his fourth consecutive Union Pacific title--but will require voting support in our Annual Membership Drive Trial Event selections if he is to get the opportunity to try for a fifth. Other contenders in this 14-member pack are Peter Gurneau (Combat Commander) and Eric Wrobel (Merchant of Venus) who claimed their third straight championships in their respective specialties. 113 new champions were crowned for the first time, including 35 who claimed their first WBC title of any kind. That left 46 enjoying another taste of victory in a favored event--with 29 of them claiming higher Boardmaster status with their third (or more) championship in their game of choice. 92 players earned their first laurels to claim genuine contender bonafides in the years to come. 15 gents managed to win two events each while the ladies' market share shrunk by 40% as only six reached the top rung in 2014. But all were overshadowed by the awesome performance of Nick Henning who won FIVE titles--a heretofore never achieved total that rendered my usual baseball analogies obsolete. The accomplishment was even more impressive because Nick had won only one of those events previously. ACCOMMODATIONS: 400 guestrooms backed by overflow accommodations in the form of nearby chalets and condos plus a neighboring Hidden Valley property offering a somewhat lower room rate. A nearly endless supply of rooms as well as a greater variety of lodging choices. The annual jockeying for reservations on site should soon be a thing of the past. RENOVATIONS: This property has been recently renovated, and like Disneyland, is in an almost constant state of rebirth. The AC unit in one of the buildings is brand new. And best of all, the BPA has subsidized the room rate to make rooms available at the same cost as our present site. More on that later. ACCESS: Despite the greater number of rooms, you will find yourself closer to the action. This is a 10-floor hotel serviced by five elevators in the tower portion alone. Disabled access is greatly improved. Parking is plentiful and free--and while it may not be close to your room, it will be closer to the meeting space for those who use their car trunks as a game cache. This was a major advantage over all other sites considered. MEETING SPACE: Overall, the space is somewhat larger than we have presently, although it tends to be more spread out with a second building similar to the Expo Center in distance from the hotel. Navigating the site will be similar to seeing the Host for the first time or akin to finding where your classes are during your freshman year. In short, lots of individual rooms as opposed to one large concrete hall. And much of it with a panoramic view of the countryside. There will be more space for vendors, open gaming and dedicated tournament rooms. Best of all, the table inventory is a major improvement in terms of both number, types and quality. 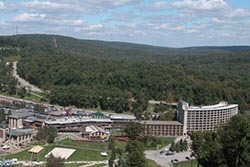 FOOD SERVICE: 7 Springs has 11 different restaurants on site ranging from fast food to fine dining--some of it within steps of the gaming areas. WEATHER: Even the climate is attractive with mountain breezes dispensing with all but the worst summer heat and humidity. There is much more to say about this exciting development--but it requires and deserves far more space than we have here--so we will be providing the details in the months ahead. Even so, 2014 will be remembered as the year the public forums changed from pillorying the Lancaster Host to criticizing the decision to leave it. We never appreciate what we have until its gone. Venue changes are always controversial and this one was no exception. The announced location change for 2016 aroused much comment, pro and con, as was expected, and understandably raised many questions--especially from those not attending the announcement or site presentations. Rather than engage in a never-ending commentary on social media with all of its attendant rumors and assumptions fueling concerns, we will prepare an extensive statement at a later time when concerns can be addressed more efficiently and completely in one place rather than being buried in a never ending thread. We will have much more to say on this subject in due course from the Director's Chair section of our website as the final preparations are made--while hopefully not confusing anyone about next year in Lancaster. Stay tuned for the details. WBC AUCTION RESULTS: The 2014 version of the WBC Auction sold all 544 lots for an average price of $33.44 for a 4.7% increase over 2013 with an ASL collection which went for $510 taking top billing. Many more details and a complete list of auction sales are available on the Auction pages. 2014 YEARBOOK REPLACEMENT: Collectors of our annual Yearbooks may have noted the errors on pages 13 and 16 of the printed 2013-14 version. These were corrected in the online versions, but those wishing a corrected book for their collections may obtain one for free by submitting the misprinted pages to Lost Battalion Games, P.O. Box 88, Upperco, MD 21155. This offer is valid until Oct. 30, 2014. 2014 ELECTION RESULTS: Incumbents Ken Gutermuth and Bruce Monnin won re-election to the Board of Directors and were joined by the return of Stuart Tucker to his second stint on the Board in the class of 2014. Stuart's election marks the first return of a prior Board member to a second term. Members are reminded that participation in the annual elections is needed to meet our Non-Profit Corporation requirements regardless of your preference for the officers. If participation drops beneath the minimum threshold required, we will be unable to continue operations in our current format. The results were announced at the BPA Annual Meeting. Vote totals and links to officer profiles can be found on the Election Results page. WILLIAM F. DUKE: We are sad to report the death of longtime member William Duke after an eight year battle with cancer. A resident of Pasadena, MD, Bill passed away on July 17, 2014, just shy of his 58th birthday. He was survived by his parents and three siblings, a wife, daughter, and one grandchild. He served in the U.S. Air Force and retired from the National Security Agency. He was an Eagle Scout, member of the Civil Air Patrol, and the Games Club of Maryland, as well as a regular participant at the WBC as long as his health permitted. He was a past champion of Rail Baron and frequent finalist in Settlers of Catan, among others, having amassed 166 laurels over an 11-year period. WBC EVENT REPORTS IN PROGRESS: 30 days after WBC, Event After Action Reports are still being collected and used to update 159 Event pages on our website for a scheduled November unveiling. Those GMs who have yet to fulfill that part of their obligation have been notified that the clock is ticking and that prize level and eligibility penalties will apply for those events whose GMs do not comply. WBC is unique among all gaming conventions for providing not only this coverage but also archiving such reports for posterity. Check out the BPA Archives section of our home page to check out the progress of your favorite event over the past 15 years. WBC 2015 EVENT SUBMISSIONS: It's never too early to begin planning for next year--especially if you want to muster support for a new event by getting it on the membership ballot or move an event into the Pre-Con. There is a limited amount of space available for early starts so if you contemplate moving your event to Monday or sooner, you need to start the process now by getting approval early enough for us to seek the required space. Such moves to or from Pre-Con or Monday status should be discussed asap with conventiondirector@boardgamers.org. Those merely wishing to get an event on the membership ballot who are willing to GM that event should complete the required Event Form after reading the GM Guidelines linked from the start of that event form. DIPLOMACY STARTS IN OCTOBER: The tournament will begin Oct. 17 with first moves due no later than Oct. 24. Each player will be assigned three games quasi-randomly that will run concurrently. Every effort will be made to make sure that you play different opponents in these three games as different nations. Moves due weekly every Friday by 6 pm EST through http://playdiplomacy.com/. No timeouts, and no missing moves (all hold twice-then disorder and disband). Solo first place: 12 points; two-way victory 10 points, three-way victory 7 points; not a victor but survived with more centers 3 points, survived with equal centers 2 points, survived at all 1 point (not cumulative). In case of a tie the player with more total victory centers in all games combined wins the BPA wood. A team with 18 centers may declare victory if no one has equal or more victory centers than the least winner. Spring 1901 is the first turn, the last turn is Fall 1920; unless the game ends earlier. Visit http://diplomacywwi.weebly.com/ for complete details. TZOLK'IN STARTS IN OCTOBER: The dynamic worker placement game (loosely) based on the Mayan calendar had its debut tournament at the WBC in 2014, and will now also have an online BPA competition on the boiteajeux.net game portal. This website allows asynchronous turn-by-turn play of the game and will send emails to inform you when it is your turn. Players will be expected to check the site at least once daily. Two rounds of 3-4 preliminary swiss-format games will advance the top eight players to single elimination. Visit http://epworthian.wordpress.com to view the tournament format, and email Rob Flowers at rpf1@mindspring.com by Oct. 19 to enter. YAURE WINS ADEL VERPFLICHTET: Christopher Yaure proved that close enough isn't just for horseshoes, hand grenades, and nuclear war--it counts in Adel Verpflichtet too. Chris qualified for the semifinals on tie-breakers (the highest of those with 17 points including two wins). Chris then advanced to the Final as the only finalist without a win--using the second tie-break as the best runner-up with 3 spaces (having a set of 10 cards). In a fitting finish to his winless title, Chris prevailed in a tie for first place with Tom DeMarco with the largest set (a one-card margin  over Suzanne Tuch's 11 card set). The 35-game tournament also awarded laurels to Tom DeMarco, Bob Hamel, Suzanne Tuch, Sharee Pack and Greg Thatcher in that order. More details including updated laurel totals are available on the Event Page. The tournament will begin again on Jan. 3 this coming year with the hope that we can finish before WBC! See all the details at http://www.gameaholics.com/adv_tournament.htm. RUBIN WINS WASHINGTON'S WAR: The seven-round Swiss-Elimination competition began in February 2013 with 61 players and ran for 16 months. Champion Dave Rubin was not among the favorites to win the tournament when it started to say the least. Indeed, in the 20 year history of BPA We the People/Washington’s War tournaments he had won zero laurels prior to this. Rubin overcame a loss in Round 1 as the Americans to Jean-Louis Dirion to go 6-1. He defeated Tom Thornsen, Greg Gollaher and Andre Heller in the preliminary rounds and advanced to the elimination rounds on tiebreakers. He then defeated Henry Rice in the quarterfinals, Trevor Bender in the semifinals and Dan Leader in the championship, all three of whom were undefeated prior to losing to Rubin. He won three times each as the Brits and as the Americans. In the quarterfinal against Rice he pulled out the win as the Americans in 1781 despite having had Washington captured in 1777. In the semifinal against Bender, he won a rare automatic victory as the British in 1777 when he cleared the map of American combat units after capturing Washington. Leader defeated Mike Kettman, Philip-Burgin Young, Kirk Harris and Bill Peeck in the preliminary rounds, Harris again in the quarterfinals and James Pei in the semifinals to advance to the championship. He also won 3 times each as the Brits and as the Americans. Pei defeated Bender in a consolation match to earn third place. Rice and Jonathan Moody were the other laurelists based upon tiebreaker points earned in the preliminary rounds. For more details on this 113-game event and current WWR laurel totals, see the Event Page.